A quick study of the most ferocious and gruesome weapon in cinema history. 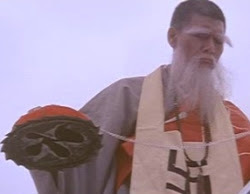 The original 1974 Shaw Brothers film The Flying Guillotine had Chen Kuan Tai battling this lethal device. Thrown with lightning quick accuracy, the weapon lands on the top of the victim's head, a hood drops over their face, and when the chain is pulled, the razor sharp blades rip into the neck tearing the head clean off. With a small army of decapitation assassins after him, Chen Kuan Tai must find a way to defeat the flying guillotine. The original guillotine design from this film is intricately ornate, but somewhat heavy and clunky. Although the assassins learn to be incredibly accurate, there was definitely room for design improvement. The movie was a smash hit with kung fu fans. 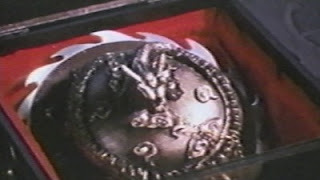 At the same time, renegade kung fu director and star Jimmy Wang Yu was coming off of the success of his film One Armed Boxer (capitalizing off of his earlier Shaw Brothers One Armed Swordsman series) In a fit of genius, Jimmy decided to combine his crippled hero with the decapitation device in the ultimate martial arts showdown. 1975's One Armed Boxer Vs. 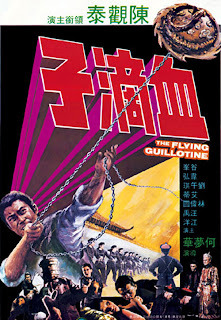 The Flying Guillotine (better known as Master of the Flying Guillotine) was the result, and is the best of the flying guillotine movies. Jimmy also greatly improved on the guillotine's design. This weapon was compact and folded in on itself. It also appeared to be lighter, and the blades were given a much more intimidating shark's teeth look. In 1977 the low budget Fatal Flying Guillotine hit the scene. This movie upped the ante by featuring a villain sporting two flying guillotines, each with motorized spinning blades. Resembling small flying lawnmowers, the powered blades were a frightening improvement, but the speed and trajectory of the guillotines seemed to be adversely affected by the weight of the new blades. Shaw Brothers dipped back in the pool in 1978 with Flying Guillotine 2. They kept with the original guillotine design from their first film, and not only did this movie feature multiple flying guillotines in use at the same time, but also multiple villainous LO LIEH'S. In the same year, Shaw Brothers also released Vengeful Beauty which was a sort of third installment in their series. of for the loan each time.